NOW: It’s my first real day of summer vacation! YAY!! Monday and Tuesday I had staff development, so I wasn’t really ‘off’ until today. And it’s kinda cool outside 😦 But that’s ok. 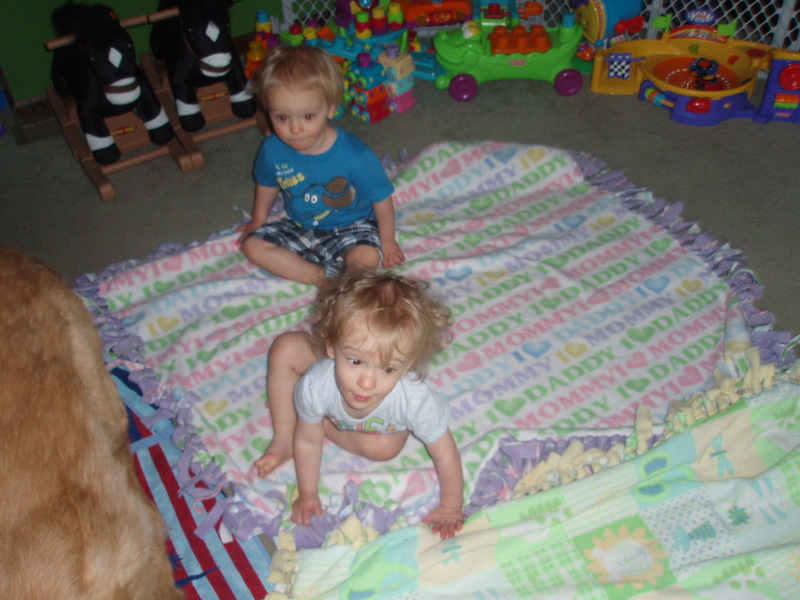 Yesterday my friend Katie baby sat the twins while I was at my school-stuff. They must have had a ball! After she left, they kept asking for her. I told them we’d see Katie Sunday at Uncle Steve’s party. Then, like 3 hours later, at bathtime, I asked if they had fun with Katie today (because they were SO DIRTY from playing outside!) They said, “Katie….Sunday…..Steve’s”. They remembered!! Wow. 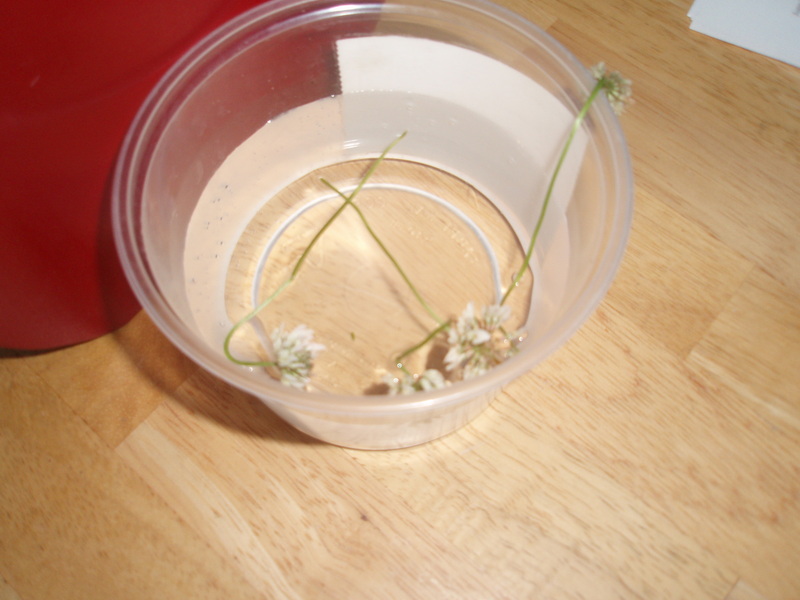 They picked some flowers for me while I was gone. They were being very silly last night at dinner. When I asked Will what he was doing with his strawberry, he told me “mustache”. What a word for a 22-month old kid. I was laughing so hard, Tim yelled from upstairs to ask what I was laughing at. I recently read an article that quoted a study. The study had found that people who had kids did not say their kids made them happier on a daily basis. I wish I could have been a part of this study – I would have skewed their numbers. 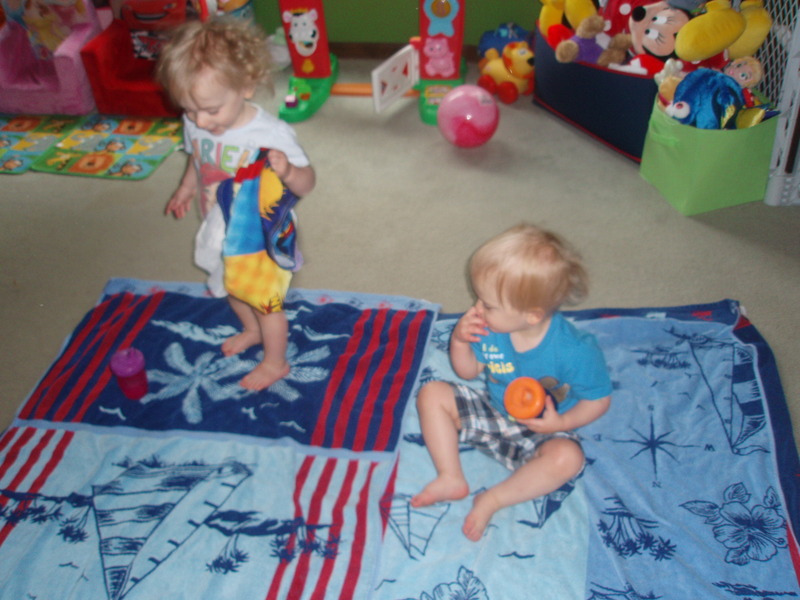 These little ones make me laugh SO much, and make me so happy to be their mommy. After dinner Will and Daddy were kicking the ball around the living room. 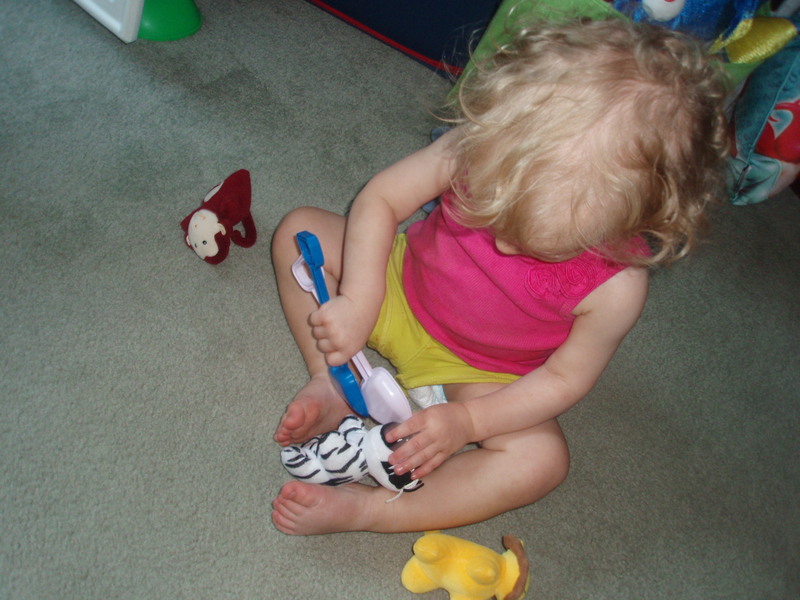 Ariel was making soup using a bucket and a shovel and feeding it to everyone – Mommy, Daddy, Will, Biscuit, Griffin, and various stuffed animals. 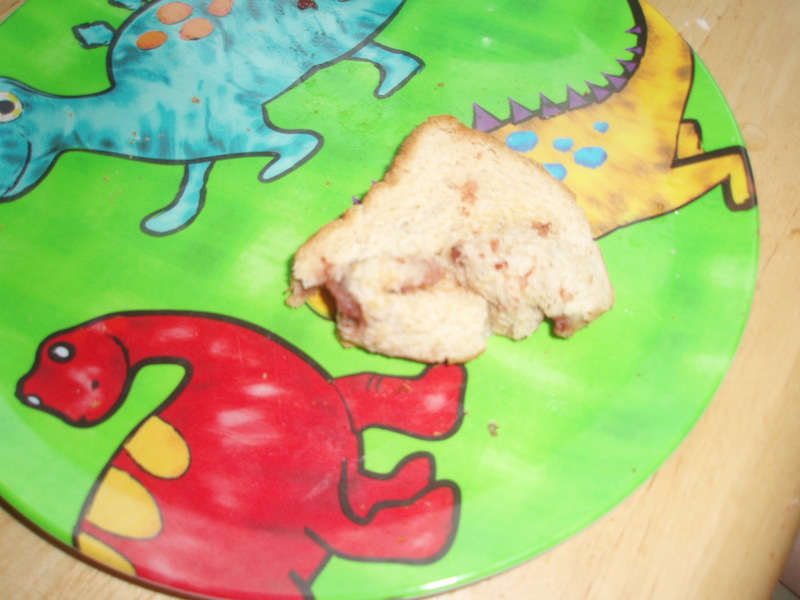 This morning they asked for toast for breakfast. Will’s got a little mangled when he decided he’d rather have Cheerios. Oh well. 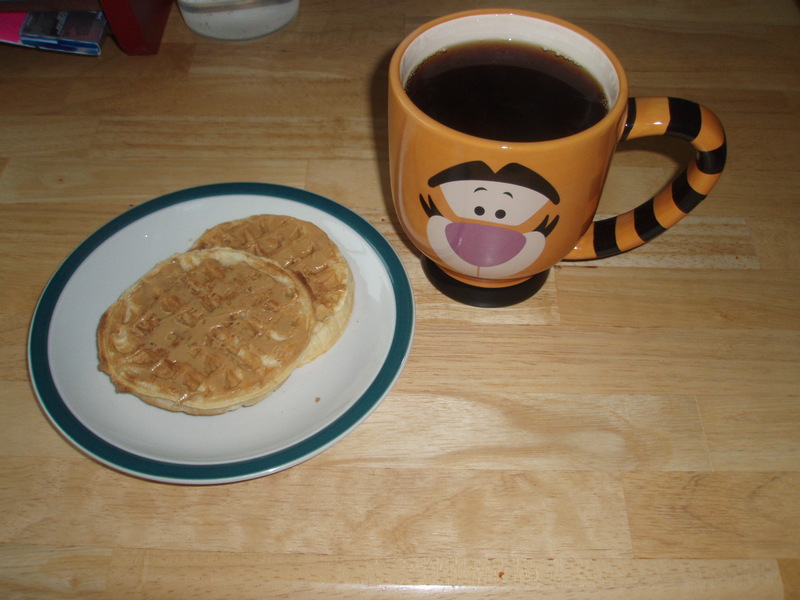 I had frozen waffles with peanut butter, and a nice, big cup of coffee in my Tigger mug. I really have to start being more creative with my breakfasts this summer. I see so many great ideas on other blogs. I need to just write down what to buy and just buy it! And just make it! Especially because Tim leaves for work before I get up, so he doesn’t have to eat what I eat. (Heaven forbid that boy eat extra fruit!) Plus, I just have more time. I’m not rushing to get the kids and myself ready to leave for Papa’s and work. So, that will be my goal for myself next week; different breakfasts. After breakfast, we played. 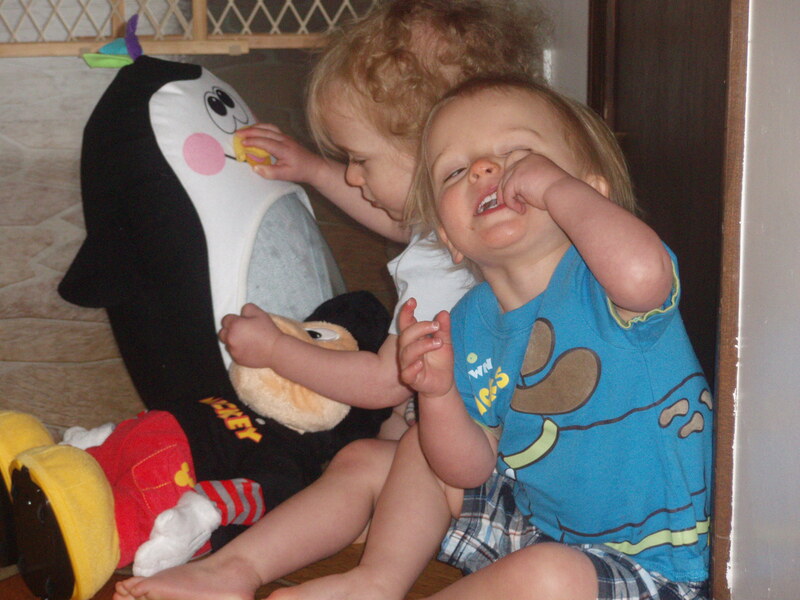 First the twins played with Dance Star Mickey and their boppy penguin. 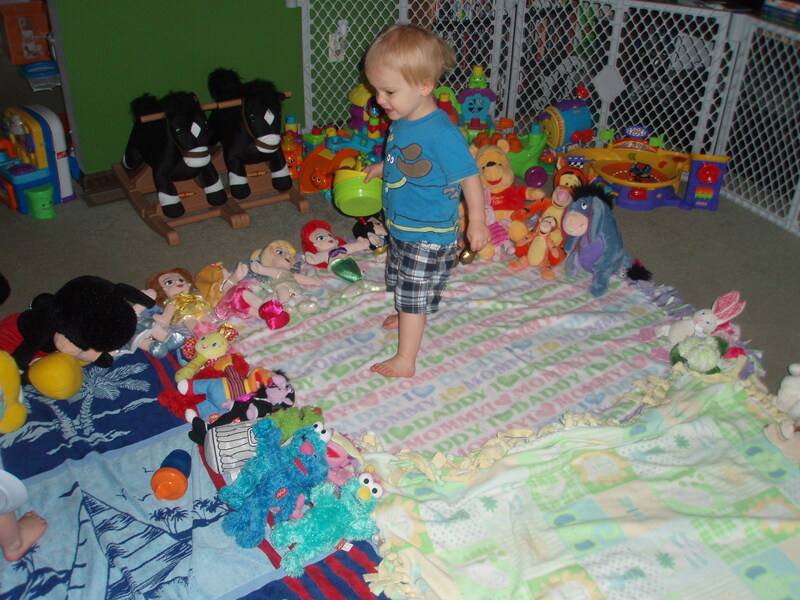 Then, they spread out a couple of towels and blankets and we had a pretend picnic. 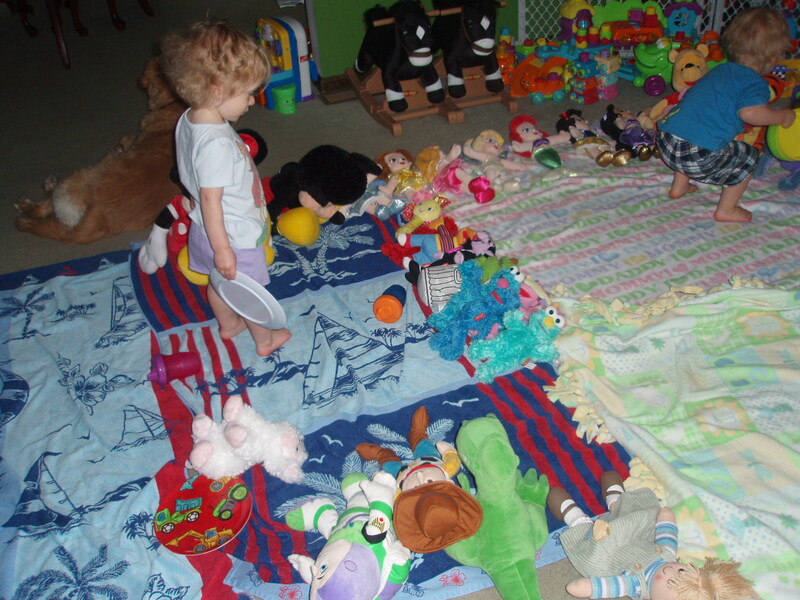 They invited Mommy, the doggies, the Sesame Street guys, the Princesses, Winnie the Pooh, Tigger, Eeyore, Piglet, Mickey and Minnie Mouse, Buzz Lightyear, Woody, Rex, and various other animals. They served water, tea, strawberries, blueberries, and cupcakes. 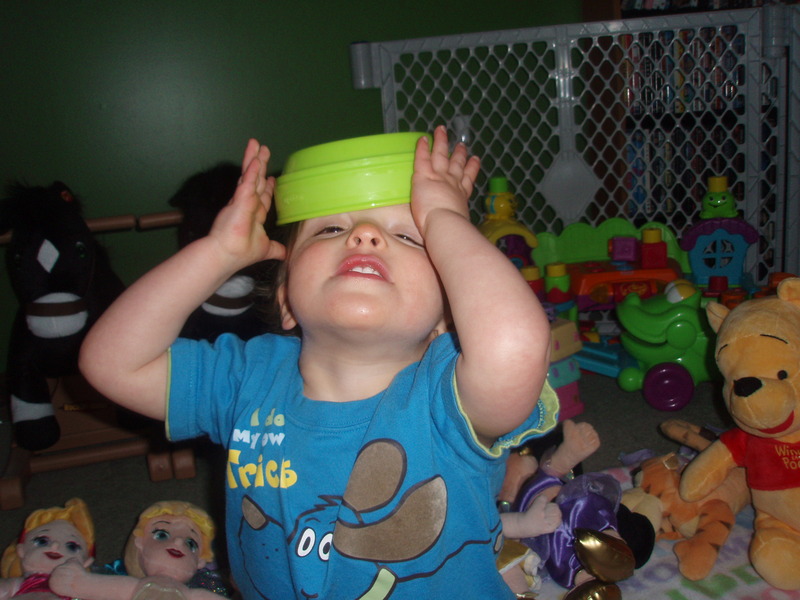 They thought of all of these things themselves, I just provided some plastic bowls and plates. I also helped peel the wrappers off of their cupcakes. I had one myself, too, of course. When the bowls were empty – *this is how you know apparently* – all of the guys went home. The twins and I had a “real” snack at the kitchen table – goldfish crackers and stars (Gerber puffs – the only “baby” snack they still request) and juice. I usually use Apple Juice or White Grapefruit Juice mixed half with water. We’re going to experiment with other juices soon. Then, we watched Sesame Street. 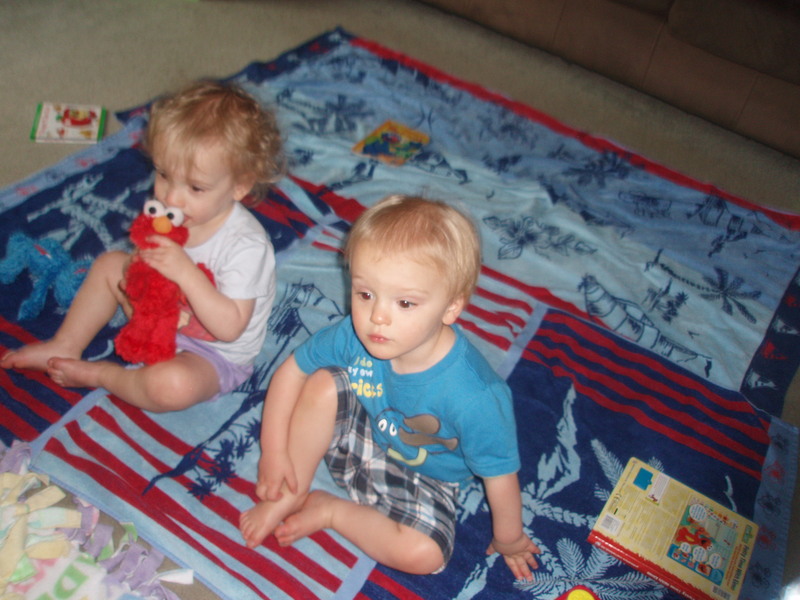 Their favorite part is Elmo’s World. 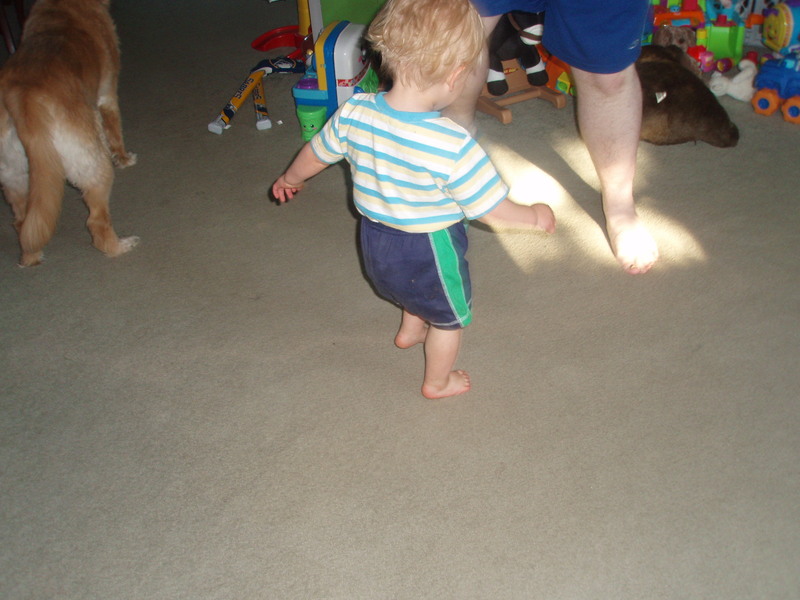 I was singing along with the theme song “Elmo loves his goldfish, his crayon too”, and paused. Ariel, my little songbird, sings “That’s Elmo’s World”. I was shocked. 🙂 Then, they turned into zombies for about 10 minutes, which is why we don’t watch too much TV. They were celebrating Dorothy’s birthday on the episode, which was funny because it’s Biscuit’s Birthday too! (Did ya read the **bad** poem I wrote to her earlier, did ya, did ya??). 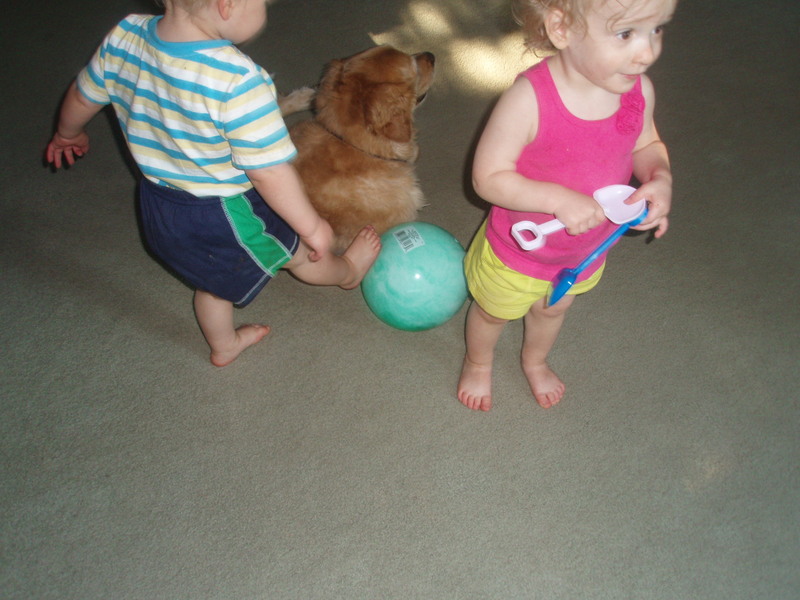 Then, we went for a cool, windy walk with their stuffed puppies in the wagon. This is now. 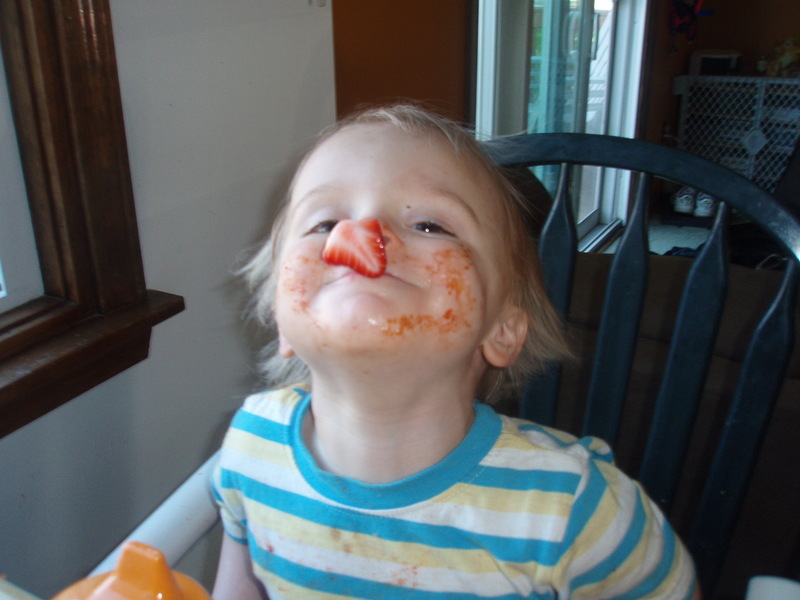 Questions: If your kid decides he/she doesn’t want what’s served, do you give them something else? Always? What would you suggest for my breakfasts next week? THEN: When I first got pregnant I found out through a blood test at the fertility doctor’s office. Then, they had me come back a couple of days later to recheck my numbers. They had pretty much quadrupled. They should have just doubled. What did this mean? I started self-diagnosing, as pretty much anyone with Internet access does, and I called my friend, Leslie the Nurse. I found out, and she thought too, that it COULD mean multiples. Yippee!!! But I had to wait for my sonogram appointment to find out for sure. I went back to the fertility clinic about a week later for the internal sonogram. They weren’t even sure that they would be able to see anything by that point because it was still so early, but they were going to try. Two. Two fertilized eggs. I figured myself to be just about the luckiest person in the world!! How exciting! I was having twins!!!!!!!!!!!!! They were each smaller than a grain of rice at that point. That was then. Good luck with the breakfasts. If you want a recipe for homemade granola let me know. It’s not too difficult, but it does take some time for baking and cooling. Hmmmm……homemade is a little scary for me, unless it means microwavable! No, just kidding, sure, I’d love the recipe! That sounds like a fun idea! I’d only be able to do breakfast though, at least for now. But that sounds like fun. We could do none of the same breakfasts for a week (weekdays), to start. I don’t know if I could come up with more than 5 different things right now. LOL! What do you think? Let’s decide before Saturday – that’s when Tim and I go food shopping.